If you’re interested in becoming an oral surgeon, let me share a word of caution. Out of the more than five dozen different occupations with huge student debt that we’ve consulted on, oral and maxillofacial surgeon is the second most expensive to become. OMFS student loans have a significant impact on you when you finally earn “real money” at the end of a 12 to 14-year educational journey after high school. When managing this debt the right way, OMFS student loan repayment strategies could mean the difference between reaching financial abundance in your mid-40s and feeling insecure (despite earning multiples of the average household income in America). The average debt of a dental student we’ve advised owes $611,286 in student loans if they’re in the oral surgeon field. Most of these oral surgeons went through an MD program. While the overall average student debt for becoming an oral surgeon is likely lower than our average, this statistic throws cold water on the salary a new oral surgeon could expect. Oral surgeons complete about as much education after graduating high school as they complete from kindergarten to 12th grade. First, you obtain a four-year bachelor’s degree while completing necessary prereqs for dental school. You might expect a typical $30,000 level of student debt for this degree. Third, you need to complete a residency in oral and maxillofacial surgery. These residency programs take between four and six years. You can also earn your MD by taking additional classes through an affiliated med school. This could add an additional five or low six-figure sum to your student debt. Boston University has a nice chart showing a typical six-year residency with the MD path. This can prepare you well for work within a hospital system. For those who seek to earn money as quickly as possible and pay down their debt, the four-year residency could be better purely evaluated under return on investment. Why Do Oral Surgeons Have so Much Student Debt? While most students leave college with a low five-figure sum, dental school is where future oral surgeons accrue the biggest chunk of their massive student debt. If you go to a state dental school, you might be able to come out with only $250,000 of dental school loans. However, if you attend a private dental school in a big city, you could easily leave with $400,000 to $500,000 of debt or more. Oral surgeons need to gain admittance to an oral surgery residency program after dental school. This training lasts an additional four to six years after dental school. 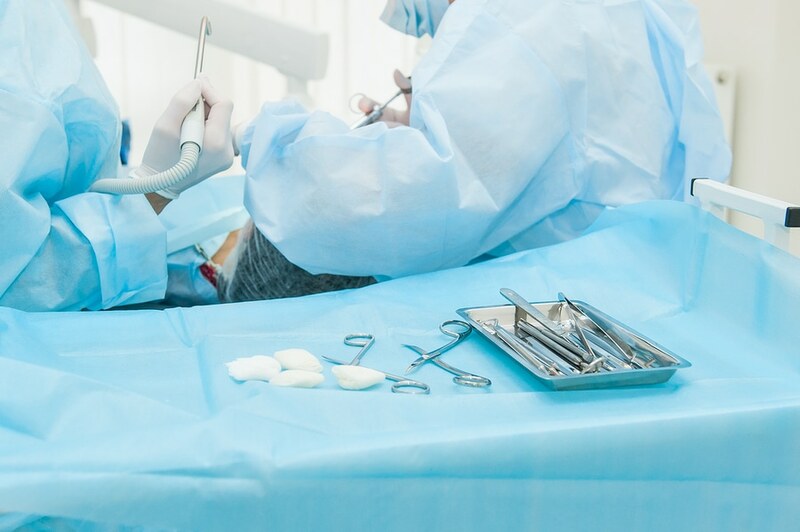 During the years you’re not in medical school in an oral surgery residency, you’ll earn a salary typical for a resident doctor ($50,000 to $60,000 range). You have the option to obtain your MD at some institutions. Usually, you will take med school classes for approximately two of your six years in the earlier part of your training if you choose the MD path as an OMFS. If you decide you want to have an MD in addition to your DMD or DDS as an oral surgeon, you will need to borrow additional funds to cover tuition. Most oral surgery residents place their loans into deferment, allowing interest to grow at a rapid rate. Residency is where I see a lot of the financial carnage happen with OMFS student loan repayment strategies. Residency deferment causes tens of thousands of interest to accrue on top of the already massive loan principal. One of my top tips for oral surgery residents is that they demand to have their loans placed into repayment on the Revised Pay As You Earn (REPAYE) program. By doing this, you could get an interest subsidy worth $10,000 to $30,000 per year while in training depending on how much you owe. This is possible because the REPAYE program pays 50% of all interest left unpaid by your required monthly payment, which is based on your income. Assume you owe $40,000 in interest on your $600,000 student loan debt. Pretend your monthly payment on REPAYE is $4,000 per year as a PGY-1. The interest subsidy on REPAYE would therefore be ($40,000-$4,000)/2= $36,000/2 = $18,000. In this case, deferment would cost an oral surgery resident $18,000 every year for four to six years. That’s a massive cost for not understanding the complex student loan repayment strategy options for dental residents. What is an Oral Surgeon Salary? Many doctors I’ve spoken with have said that oral surgeon salary is all over the place depending on what kind of practice environment and geographic location you’re talking about. The Bureau of Labor Statistics (BLS) states that the average oral surgeon salary nationwide for 2017 was $242,740. This seems a bit low to me. Many of the OMFS doctors I’ve worked with started around $250,000. Practice owners often make in the mid 300,000 to 400,000 range. One doctor claimed to have a friend in Maine earning over $800,000 per year as an oral surgeon. 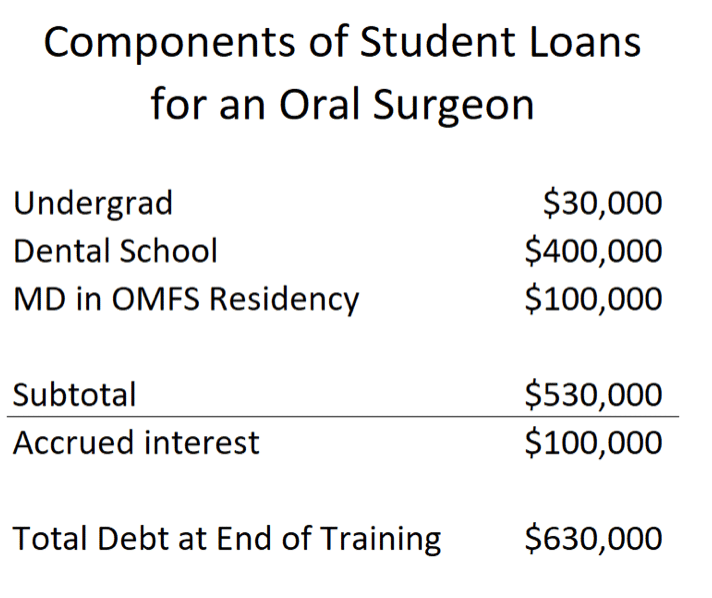 Assuming that $400,000 is more in line with actual oral surgeon earnings, how would a doctor handle their $600,000 student debt from becoming an OMFS? How Do You Pay Back Student Loans as an Oral Surgeon? Let’s assume Connie decides to do a six-year oral surgery residency program. She accumulates $600,000 during her first couple years of the OMFS curriculum while she’s getting her MD. She decides to consolidate at the end of her MD program and get her loans set up on the Pay As You Earn Plan. On this plan, you can pay for 20 years and have your loans wiped away at the end after paying tax on the forgiven balance. When she graduates after six long years of training, she should have at least four years credit towards the 20 that she needs. We will assume she starts earning $400,000, but that she writes off $75,000 per year from depreciation, retirement contributions, and business interest expenses. That means her Adjusted Gross Income (AGI) is around $325,000. We’ll adjust that upward for 3% inflation. These results are incredible because they reveal a huge misconception about paying off student loans in full after becoming an oral surgeon. Even at a high income, the PAYE program allows Connie to pay less than half what she’d have to pay with refinancing. Connie would need to pay taxes of $358,606 in 16 years after she earns her MD (assuming she starts repayment right then instead of waiting until residency ends). If you use present value to answer the question of what the OMFS degree costs in today’s dollars, you’d see that the difference in cost of the two approaches is roughly $234,000 in 2018 US dollars (the column farthest to the right). If your grades and profile get you into an oral surgery residency program, you’re already very smart. That said, the student loan rules are boring and complicated enough to make mistakes extremely common. Don’t assume that loan forgiveness programs aren’t for you as an oral surgeon, even if you earn a huge salary of over $300,000 per year. If you want to refinance your student debt, try to prioritize four-year programs over six-year programs. Also, resist earning your MD unless you’re doing it because of your passion rather than the increased financial reward you expect. Many oral surgeons could qualify for some of the lowest interest rates in the country on a refinancing. That said, when implementing OMFS student loan repayment strategies, you need to make sure you’re putting your earning power as an oral surgeon at the top of your priority list. If you have several hundred thousand of student loans from your oral surgery program, we would love to make a customized plan for you. In fact, we’re probably the only team in the country that regularly consults on debts above the $600,000 range typical in the oral surgery field. We take pride in providing smart student loan repayment strategies. Avoid refinancing too soon, sign up for the REPAYE plan if you want subsidies while in training, consider PAYE if you’re sure you want forgiveness, and focus on building your earning power through the right job opportunity. Build your assets and play catchup with the above average income you’ll earn as an oral surgeon. Finally, avoid deferment and forbearance like you’d want to avoid a facial infection (excuse the joke). What has your experience been as an oral surgeon paying back your student debt? How fast were you able to do it, are you worried about forgiveness on such a high income, and how are you currently managing your OMFS student loans?